Open mic night is on every third and fourth Thursday night of the month at Camp Hills Bowls Club. To celebrate the first anniversary here’s the story of how it all happened from William Whitaker. 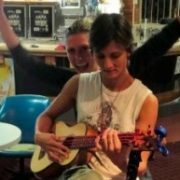 In about July 2014, I visited my friendly chiropractor, and fell into a conversation about ukuleles and BUMs with the assistant, Angie, who comes from a very musical family. I mentioned that there were a lot of groups around Brisbane now as the craze has spread quickly. Angie rued that her local Bowls club was so quiet during the week, and that it needed something to attract more people. I suggested a trivia night, a games night and then ‘What about an open mic?’ We agreed that it was worth trying. A few days later we met at the Camp Hill Bowls Club, chatted to the barman, and agreed to set it up. The sound equipment was rudimentary (used mainly for chook raffles and the like) but we would have a go. The club provided the room free of charge, and we would support the club by purchasing drinks and meals. A ‘win-win’ arrangement. Players would bring their own songs to play, and all performances would be encouraged and appreciated, as we knew what it was like to get up in front of an audience. And did I mention there is the Pan Thai Restaurant adjacent with great meals that are delivered to the table? I woke that night and thought … mmm, need something catchy so we can’t forget when it’s on. We had a bit of interest from some die-hard ukers, so we thought ‘hey if there’s only six of us, we can keep this going for a couple of hours.’ And so it started. We had to coax several of the players up initially but when we all got the hang of it, it started to move along and the allotted two hours sped by. So dear reader, we have a hardy core of musos who hang out for the chance to get up and have a go, either solo, in a duet or a group. We’ve had a Cook Islander with his special uke, a young Chilean lady who sang in Spanish, semi professionals, first timers and even families chance it and come away with huge grins and thunderous applause. And WOW! Some of those voices, not to mention the different playing styles. Many were jumping out of their seats for another chance to perform. It was quite amusing. All in the name of fun and ukes. A while ago several of the players suggested that since we were having such a great time but sadly only once a month, a second night should be held. It would help the club, give another chance for performance addicts to strut their stuff, and provide another opportunity for those who couldn’t make it on the third Thursday. The last week seemed the obvious choice as the ‘uke scene’ was usually pretty quiet. And so we have introduced the fourTH THursday as well. So come along and join our happy group. Everyone is warmly welcomed. 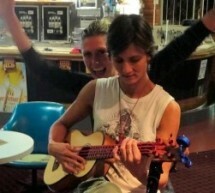 Do your ‘uke thang’ and relax, have a great meal and a couple of drinks. Open mic night every third and fourth Thursday night of the month at Camp Hills Bowls Club.